Shaver Lake is just 45 miles from the Fresno and Clovis communities in the San Joaquin Valley. It sits a mile above sea level and offers cool, clean water for those that love swimming, boating and fishing. So get your family or friends together and come on up. Rent one of the three pontoon boats available to you. One is a 12 passenger 25 foot long long Sun Tracker party barge. It has a 50 hp engine. It is very clean with carpet on the deck. It is very dependable. Think of the fun the kids will have. Bring an inner tube so you can tow someone behind the watercraft. There is also a 22 foot long Benninton that holds up to 12 passengers. 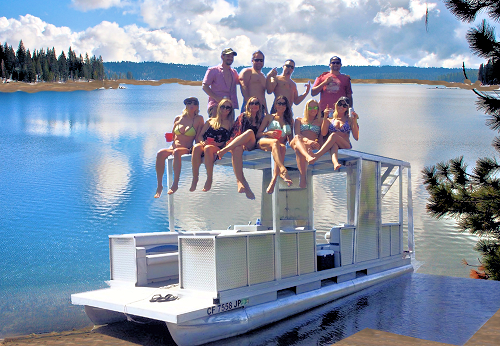 The third is a new ultimate party barge available for $400 all day from 9am-6pm. There is a $500 deposit required and we will charge $20 to drop it off in Camp Edison. Here is a great way to live life to the fullest this summer without breaking your budget. So pack your swim trunks and fishing poles, make a Reservation Below, then head to Shaver Lake Power Center and have the time of your life. Please download, fill out and bring this Contract with you. It will save you time. The only requirements are that you be at least 18 years old, have a major credit card and a valid driver's license. If you meet these requirements, you can be having the time of your life in no time, thanks to our fast and easy rental application procedures. Included in your rental is basic safety equipment that is required including life vests. Our equipment is durable. It has to be to keep up with the playful, adventurous spirit that is at the heart of the American identity. 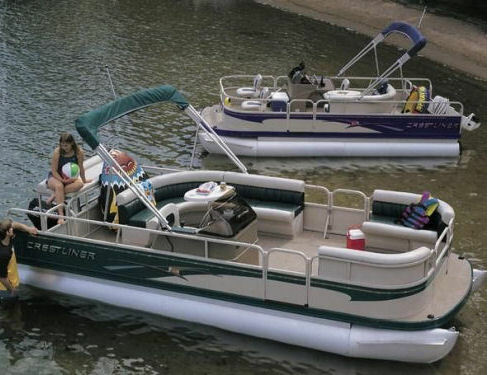 The rental rate for the pontoon boat is $250 per day, plus a $500 Security Deposit.